The Cockburn Wetlands Education Centre School Holiday Programs are without doubt one of the best value school holiday programs in Perth and are great way to get the kids back to nature this school holidays! They run amazing eco walks, talks and night stalks, with all programs costing less than $5 - most are by gold coin donation. The Cockburn Wetlands Education Centre is located on Hope Rd, Bibra Lake, and is open during the week. There's not much at the centre itself, it's mainly used as a conference/ function venue - someone may be present in the centre during the week, but also may often be out in the field. There are coffee and tea making facilities available. If you ever pop into the centre there are lots of pamphlets on all things environment in Perth, and there are some aerial maps of the area. There are some nice walks around the bushland that surrounds the centre and a little picnic table where you are welcome to bring some lunch and sit and enjoy the serenity. 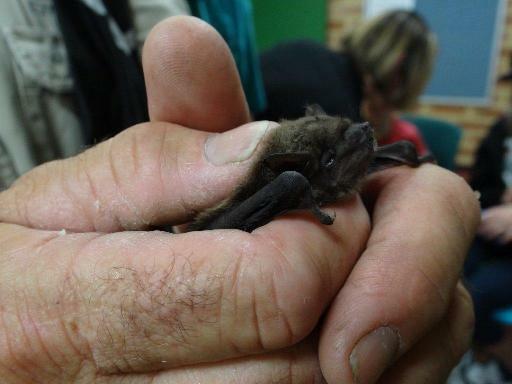 We discovered the wonderful school holiday program at the Cockburn Wetlands Centre, last school holidays January 2013 and were lucky to get in on their amazing Bat Stalk! It was hands down the best value thing we did in the school holidays! The evening started with an Bat Presentation from Joe (yep that's Joe in the picture in the very cool reflective bat vest!). He clearly loves and is very passionate about bats. His presentation included his story about his 8 year journey to create the perfect bat house. (You can see Joe's blog at www.gobatty.com - you can also find out how to purchase one of his awesome hand built bat homes here). 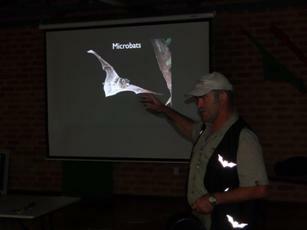 Joe had the kids mesmerised and it was amazing to see how many clever little bat fans their were in the audience, some of these kids knew A LOT about these amazing little creatures. He even had a bat so that everyone got to have a look and a pat. The only problem with some environmental programs is that nature can be temperamental - and may not put a on a display on the day (or night). I must admit I was a little worried we weren't going to get to see any bats and I was going to have a disappointed 6 yo on my hands, but this was definitely not going to be the case today. 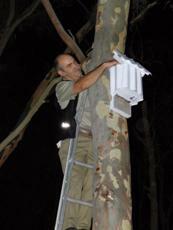 Joe has worked hard over many years developing this home for the bats at the Cockburn Wetlands Centre. There are about 26 bats that call this beautiful part of Perth home and we got to see an amazing display of bats flying in and out of the homes that Joe has created for them. So after the presentation, all armed with torches (and covered in Aeorguard) we hit the walking trail to see - what for some of us - our first bat! 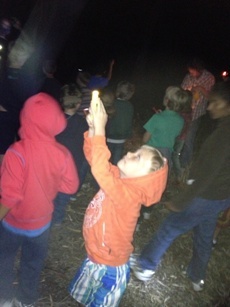 There was lots of excitement in the air and it was beautiful to be out and about in the dark of the bush at this time of night - checking out what nature had to offer. 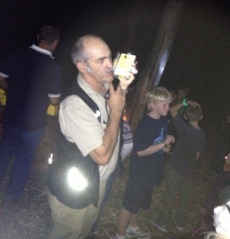 Oh and this was no random wander around to find bats - Joe was armed with the latest technology in bat tracking so we knew they were active all around us. Joe firstly took us to where he had several of his own designed bat homes up in the tree. It took a while but Joe managed to coax the bats out and they flew around out of their homes and back in again - so we all got to see them out of their homes and flying through the bush. 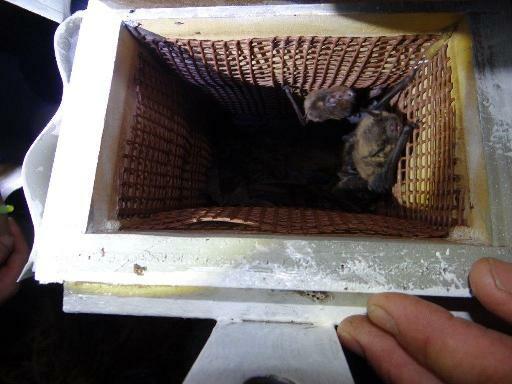 He also brought one of the boxes down so everyone could get an up close and personal encounter with the bats! After seeing the bat homes Joe took us for a wonder through the bush to check out the other night inhabitants and gave tips on night stalking. He recommends using a high powered head lamp or holding a high powered torch to your head and looking around - this way you can catch the eye shine from bush creatures reflecting back at you. Use this technique to get the most out your night stalking adventures! After our Bat Stalk came to an end, we had a nice cup off coffee and some fruit and cake - and the kids got to quiz Joe with all their bat questions. All I can say is that we will be back next school holidays for more of the amazing programs run by the Cockburn Wetlands Centre. If you are interested then join their mailing list at the Cockburn Wetllands Centre home page (join up box can be found on the left hand side of the home page where it says join blog). You'll want to know about the programs as soon as possible because they book out fast! Even if they are booked out it is worth putting your name down as they may run additional sessions if there are enough numbers. Find the most recent school holiday program here. We'd love to hear about your Cockburn Wetlands School Holiday program experience below. Have You Enjoyed a Cockburn Wetlands School Holiday Program? Which one was it? And what did you love the best? Enter your story here... we'd love some pictures you can add them below, but you don't have to!